Shape Services lets us know that IM+ Mobile Messenger has been updated to version 1.0.2. IM+ supports MSN, Yahoo!, Google Talk, AIM, Jabber, ICQ and MySpace with no cost per message (messages sent using data plan). The app has received a huge price cut. IM+ Mobile Messenger is now $2.99, down from $9.99. It is available in the App Catalog. 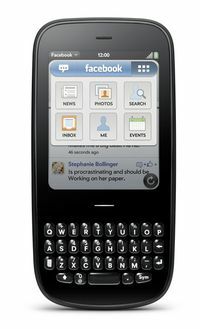 Not content with all the updates in webOS 1.4, Palm has just released a major update to their Facebook application. It’s available in the App Catalog now and it’s compatible with all webOS phones. It’s free, it’s Facebook, so go get it and let us know what you think. Stay current: You can keep up to date with your Facebook inbox, latest Facebook events, friends’ birthdays, and your news feed. You can now view your friends’ Walls, Information, and Photos, and keep tabs on your own Wall. Stay in touch: Reply to messages in your Facebook inbox or compose new messages, Like and Comment on items in your News Feed, and find friends (old and new) with new Search functionality. Share photos: You can show off your photo albums to friends, as well as view, like, and comment on photos and albums. You can also quickly upload photos directly from the Facebook application. 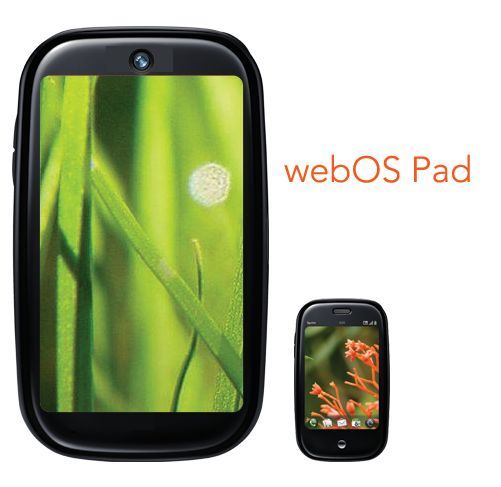 How would you build a webOS Pad? There’s plenty of chatter on the Internet regarding the iPad. Spend some time in an iPad forum and you’ll find it’s mostly negative. It’s not that the iPad is a terrible product. Most haven’t seen it in person or held it in their hands. I’d venture to say that most think the concept is a great idea, given the massive excitement prior to Wednesday’s announcement by Apple. So if there is a new market for a product that fits somewhere between smartphone and laptop, wouldn’t you think Palm would be positioned to jump in and quickly? webOS developers can easily scale their apps to fit on a mythical webOS Pad with a few easy code changes. With fallout from the iPad, you certainly wouldn’t need any focus groups to know what people want from this device. Here’s what we’d like to see if Palm were to design a webOS Pad. Feel free to add your thoughts in the comments section. Flash support: On a device of this size, there is no good excuse for it not being supported. Plus, we know it’s coming with 1.4, so we can safely put it on our webOS Pad. Productivity apps: Ok, Apple’s got their iWork suite, so Palm would have their work cut out for them here. Provide the developers who create Docs To Go the ability to create a native app, one that would allow for editing Office Docs. Games: webOS PDK is scheduled for a public beta in March, so we should see ramping up of games. eBooks: Partner with Barnes and Noble on a built-in eBooks store. Webcam: Video conferencing, support for Skype would certainly make for one hell of a launch. Can you see Jon Rubinstein starting up a video chat? Support for assorted Bluetooth accessories such as keyboards, mice, etc. We could go on and on. Instead, we ask our readers to chip in and let us know how you would make the perfect webOS Pad. Who knows, maybe next year at CES we’ll get our wish. Dream big! It seems like we’ve been talking about a potential Verizon release of Palm’s new webOS devices for quite some time, so it’s exciting to finally be here at launch day. 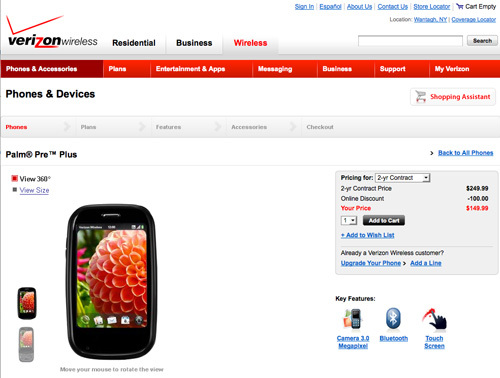 Yes, the Palm Pre Plus and Palm Pixi Plus are both available today on Verizon Wireless. The Palm Pre Plus, offering 16GB of storage and 512MB of RAM, is priced at $149.99 (with a 2-year agreement after $100 mail-in rebate). The Palm Pixi Plus is available for $99.99(with a 2-year agreement after $100 mail-in rebate). What’s more, Verizon is offering buy one, get one free (affectionately known as BOGO) with the Palm Pixi Plus. If you buy either a Palm Pre Plus or a Palm Pixi Plus, the second is free. Of course, all phones need a 2-year contract agreement. Those ordering online will not have to suffer through the mail-in rebate process, with Verizon offering online credits on both phones. You can find both new webOS devices at your local Verizon retail store or at Verizon Wireless Online. This being launch day, we’re thinking it might be a good idea for Verizon to say, put these new webOS devices front and center. If you are planning on picking up either the Palm Pre Plus or Palm Pixi Plus, don’t forget to shop the EverythingPre Store for all your Palm webOS accessory needs. Join us for live coverage of the Palm event at CES 2010. Coverage will begin shortly before 11:00 a.m PST or 2:00 pm EST. If for any reason we have trouble with our wireless coverage, you can follow our live updates on Twitter by following @everythingpre. Following the launch of paid apps in the US and subsequent removal of that pesky beta tag on the App Catalog, Palm announced that the European e-commerce program will go live in March of 2010. Not only does this benefit our European friends, but will provide a big boost to developers. The Palm Pre is currently available in the UK, Ireland, Spain and German. Safe to say, it’s good news all around come March. It was only a matter of time given the steady stream of apps, but we’re pleased to see Palm hit the 1,000 app milestone. With the release of webOS 1.3.5, the App Catalog is no longer in beta and now they’ve reached 1,000 apps. Sure, there’s some Brighthouse Labs filler in those numbers, but that’s an occurrence found on other major platforms. Either way, this is an accomplishment worth noting. In a nifty PR move, Palm orchestrated Engadget’s new webOS app as the 1,000th app, almost guaranteeing coverage throughout the tech blogs. It’s also a good looking app if you have any interest in the latest gadget news. Palm closes out a very successful 2009 and all eyes will be on the company again this Thursday when they present at CES. We’ll be there to cover it live, so be sure to check back for complete coverage. EverythingPre offers ad campaigns to meet any customer’s needs. It’s a great way for developers to generate awareness among consumers and more importantly sales. Campaigns are based upon CPM (cost per 1,000 impressions). We currently offer the following ad positions. Advertisers can submit multiple banners and manage their campaign using our advanced adserver. In addition, you’ll have access to statistics that are updated hourly. This allows our advertisers to maximize the efficiency of their campaigns. With the release of the new Palm Pixi, it appears it’s pushing down the price of the Palm Pre. 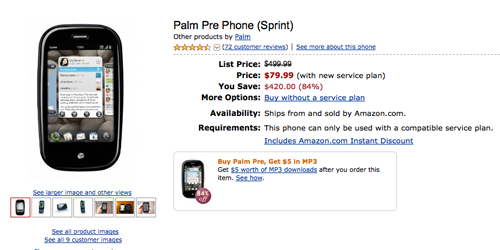 Amazon has dropped the price of the Palm Pre to $79.99, with a new 2-year agreement with Sprint. This is the lowest price we’ve seen on the Palm Pre. With the Palm Pre at $80 and the Pixi to be had for $30, there are plenty of inexpensive options to get your hands on a webOS device. How long before one or both go free?